The Quail Lodge Motorcycle Gathering at Carmel, May 17th in addition to its amazing display of bikes showing on the green the Quail is proud to present a special display celebrating the 100th anniversary of the Bonneville Speed Trials. This tribute is being distinguished with motorcycles from the salt, modern to vintage, from home built to world class professionals. Remember your “gourmet lunch” is included in your ticket price. Should you want to stay over in the beautiful Monterey Bay area, for rooms, we have the following partner hotels. Both hotels have extended a special room rate for The Quail Motorcycle Gathering participants. Be sure to mention you’re booking for the Quail Event. This entry was posted in Motorcycle Museum, Motorcycle Museum: The Latest Updates on 13 April 2014 by oldgeezer. After a bad few weeks following the leaky roof and the ruined floor, we’re surfacing again. 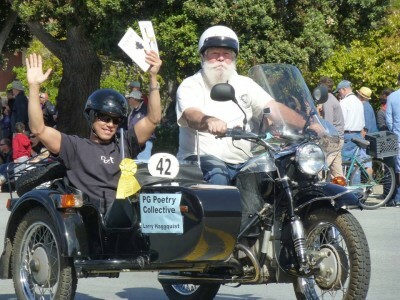 Today, April 5, we rode the 2002 Ural sidecar rig in the Good Old Days Parade on behalf of the PG Poetry Collective, hauling a beloved and award-winning teacher and poet, Larry Haggquist, to see his adoring fans. Then we came back to the Museum and opened it up to hundreds of new visitors, including many from out of town, who were here for Good Old Days. 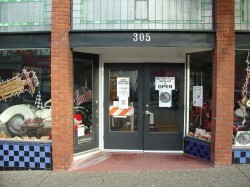 With some of the bikes gone, it’s back to looking like it did when we first opened — sort of. The little bikes are still stored behind the door and we’re trying to figure out how to display them and still leave room for people to move around. But the Vespa is front and center, and tomorrow morning we’re going to take it for a First Sunday scooter ride. All are welcome to help us eat leftover cookies. 2002 Ural/Ural sidecar rig, Neil driving and Larry Haggquist entertaining the crowd. This entry was posted in Motorcycle Museum, Motorcycle Museum: The Latest Updates on 5 April 2014 by oldgeezer. I have four free tickets to this Friday’s race at Laguna Seca (first of the Red Bull US Grand Prix). These are comp tickets and are clearly marked “Not for Resale.” I get them because I volunteer out there, and the party I was giving them to found they can’t attend. If you want these tickets, call 831-331-3334 to arrange for pickup today, Wed., 7/17/13 or tomorrow, Thurs., 7/18/13. You need to come to the Museum in Pacific Grove. First come, first served. 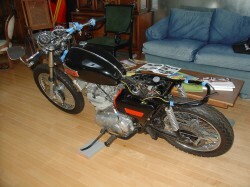 This entry was posted in Motorcycle Museum, Motorcycle Museum: The Latest Updates on 17 July 2013 by oldgeezer. 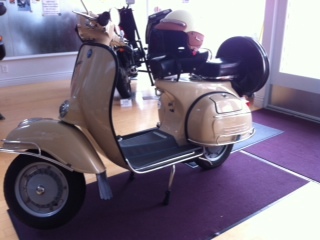 This entry was posted in Motorcycle Museum, Motorcycle Museum: The Latest Updates on 16 July 2013 by oldgeezer. 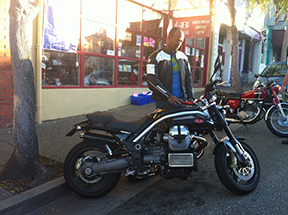 The Century Loop is a world-famous motorcycle ride through the Santa Cruz Mountains. To access the Loop, you can come from Hwy. 280/Woodside or up Hwy. 1 from Santa Cruz, or Hwy 9 from Cupertino, or down Hwy 1 from San Francisco/Pacifica through Half Moon Bay. I prefer to start and end from Santa Cruz. This entry was posted in Motorcycle Museum, Motorcycle Museum: The Latest Updates and tagged Century Loop, motorcycle ride on 15 June 2013 by oldgeezer. 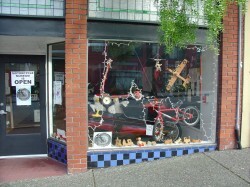 We decorated the Museum for the season with most of my collection of old toys: A sled, some scooters, old clamp-on skates, wooden toys, a pedal fire engine, a pogo stick and more. We wound twinkle lights around them and are feeling festive…When Christmas is over, we’ll stow the toys on top of the display cabinets inside the museum to await the Christmas season next year. Old toy donations gratefully accepted. 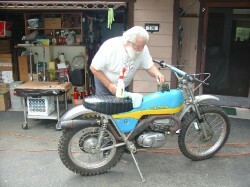 This entry was posted in Motorcycle Museum, Motorcycle Museum: The Latest Updates on 17 December 2012 by oldgeezer. When you leave the door open on your motorcycle museum, you have to be prepared for whatever rolls in the door. 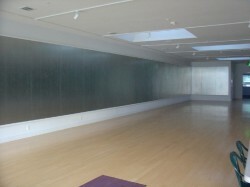 A few weeks ago, a guy from Pacific Grove stopped in and took me aside. 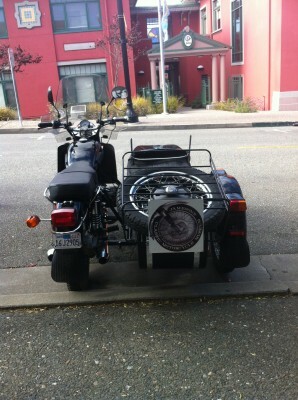 Seems he’d remarried, and the new wife doesn’t like his motorcycle. Not that she’s against BMWs per se, it’s that it was taking up her garage parking spot. So he was off on his honeymoon and wanted a place to safely store his bimmer. When I heard what it was, I agreed. 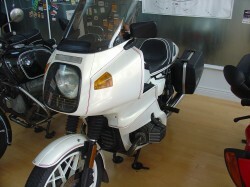 It’s a 1983 R100RS, the last of its series. See, I have 1977 R100RS, the first of the series. Now all I have to do is get mine down there to the museum and they’ll make great bookends. Mine survived the 1989 Loma Prieta earthquake with only minor damage to the fairing — it was safely on its center stand, the earthquake laid it on its side. It’s one of my favorites and I’m hesitant to drain the gas and put it in the museum, but the rainy season is coming so I just might. The last of the series. I own the first one, a 1977 R100RS. Then Cheryl Kampe came by with her camera — as many people have — but in her case she was photographing in order to be able to paint. A very talented watercolorist, Cheryl has done a series she calls “Cycles, Saddles and Chrome.” The paintings are hanging in the museum for all to enjoy, and they’re for sale. We’re at 34 vehicles last time I counted. I think they might be reproducing in the dark, but they make people happy so who cares? We’ve hired a regular window washer to keep up with the nose prints on the windows from people peering in. We’re still making plans for showing movies and DVDs when the weather gets nasty. Cheryl Kampe’s painting, Norton Commando 850. This entry was posted in Motorcycle Museum, Motorcycle Museum: The Latest Updates and tagged 1983 BMW R100RS, second marriage on 11 November 2012 by oldgeezer. Wow! I let a month get by me! Since then, I’ve added some interesting bikes… and I’m now up to 34. I think. 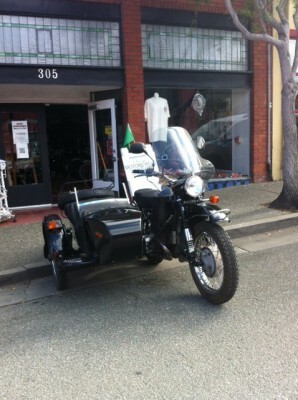 Included is my 1958 BMW R27 “Thumper,” all original 250cc single cylinder, brought to the U.S. from Heidelberg, Germany. There’s a 1974 Triumph 500 cc Twin, Dual Sport (Trophy Trail), a bike that the British Motorcycle Museum in Birmingham, England was drooling over. Luckily I didn’t sell it to them — their museum burned to the ground the next year after our visit. Are you a scooter affecionado? I picked up the sweetest 1966 Vespa Piaggio 150 Deluxe (dual saddles, spare tire, chrome nerf bars all the way around), absolutely pristine and starts on the first kick. Not only that, it came with two original Vespa helmets, color matched to the scooter, with leather visors and ear flaps. I took it to the Chamber of Commerce business expo where it was a star attraction. Also on display is a 1999 Indian belonging to Tony Gamecho. Baby blue with American Indian designs and the most unique kickstand you’ll ever see. 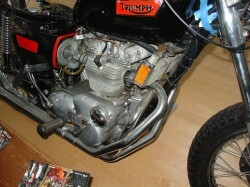 My latest acquisition is a “project” 1973 Triumph Trident which, when I get it fully assembled, will be a cafe style. It was a father/son project and the son went off to college, so I scored big time. I have begun to unpack the pieces of equipment I bought for the “shop” down there and I plan to make that Trident the first project. It’s now up on the rack, but have I had time to work on it? Noooo. In the near future, I’ll be finishing my John Penton Commemorative 6-day Trials. 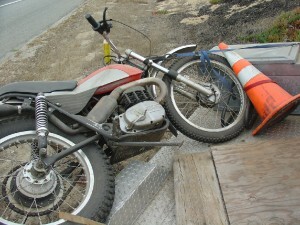 Bill Stewart’s 1969 Husqvarna is on hand, along with a rusty little Honda Passport that a Pacific Grove man found under some vines in his back yard, where it had been languishing after the former property owner died. “The starter assembly is in the can in the basket.” Will I ever get it together? Hmmm. Those little bikes, including the Vespa, are attracting an amazing amount of attention, a reflection I guess of the new worldwide popularity. 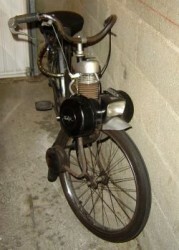 I have a 1980 Peugeot moped that has seen a lot of miles and was left alone for too long. Below is a picture of the Triumphs and Bultacos. They’re a little closer together now, to make more room. Come by some weekend and tell me your stories. 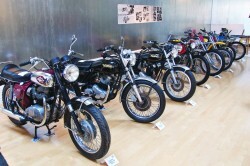 This entry was posted in Motorcycle Museum, Motorcycle Museum: The Latest Updates on 24 September 2012 by oldgeezer. The museum is open and hundreds have stopped by, from the Chamber of Commerce types to Harley clubs. We’re having a ball, listening to stories and generally wasting time. There are now some 25 bikes there, from sidecar rigs to dual sports to touring and everything in between. As bikes come in and out, you’ll want to have a look. I’ve been bringing them in two by two, but here’s an example of how not to add to your collection. 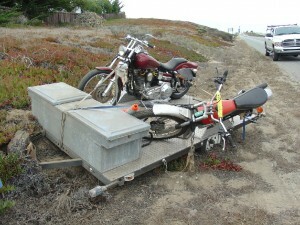 A FUNNY THING HAPPENED ON THE WAY TO THE MUSEUM: Sailing down Highway 1 near Marina, Murphy unhitched the trailer and set it free, with a Bultaco Alpina and a Harley along for the ride. Hang on, Edna! We’re goin’ down! The trailer coasted to a stop with the tongue buried in a sand dune. The hitch was intact and still fastened, and the chains hadn’t come undone (though they did break). Still can’t figure out how it came loose, but the slide down the pavement ate up the little wheel assembly in the front right down to the tongue. Had there been a berm or a curve, I might be writing a different story. We all survived, with the help of a young man who wasn’t even born when Bultaco made its last bike, but he saw the incident and pulled over to help me right the bikes. I saw him later at Moto GP and thanked him again. They’re now safely in the museum though the Harley wet its pants — it’s now leaking oil where it wasn’t before, but being as how it’s a Harley, who’s to say the accident was the cause? Today I’ll rearrange things a bit, because I’ve also added my 1958 BMW R27 and a good-looking Indian (Gilroy model) with an outrageous paint job. I brought it down at about 4 PM Sat. Aug. 25 and already it has been the subject of a photo shoot by a local pro. Photos on the website later, when I get it all arranged. 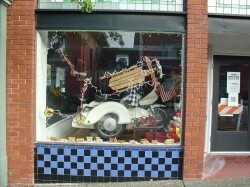 This entry was posted in Motorcycle Museum, Motorcycle Museum: The Latest Updates on 26 August 2012 by oldgeezer. It sure looked like a lot of room on opening day. You should see it now! We have a section for scooters and one for motorized bicycles. This Solex was ridden from the Central Coast to Oregon and back by a 17 year-old girl back in the 1970s. 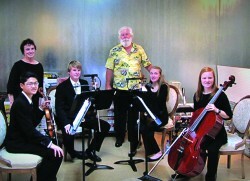 The Sea Otter Quartet entertained at our grand opening. 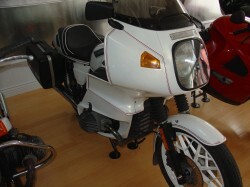 This entry was posted in Motorcycle Museum, Motorcycle Museum: The Latest Updates on 9 August 2012 by oldgeezer. 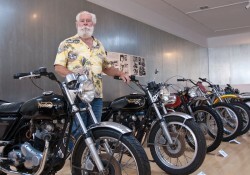 “Neil Jameson, whose motorcycle museum at 305 Forest Ave. has been the subject of much speculation, will be volunteering at Laguna Seca during Moto GP and so advises that the museum will open for weekends only on Aug. 4 and 5. 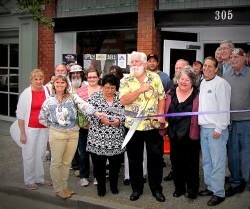 A grand opening is planned. 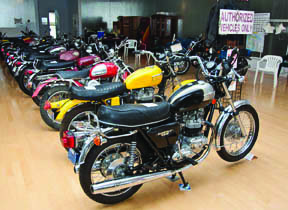 On display will be a number of vintage motorcycles, in as-is condition, from his collection. There is no cost to visit the museum. 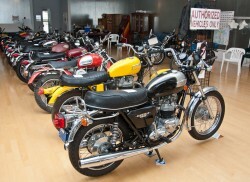 Other vintage motorcycle owners will display their machines from time to time in future months and years. It’s a big space to fill! 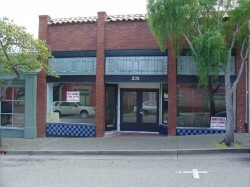 305 Forest, a 100 year-old building. 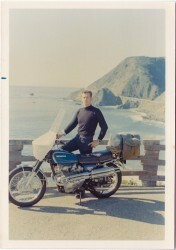 Old Geezer in 1969, with the Bixby Bridge in the background. 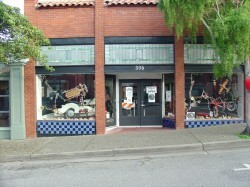 This entry was posted in Motorcycle Museum, Motorcycle Museum: The Latest Updates on 6 July 2012 by oldgeezer.